In 2014, under the Obama Administration, the U.S. Department of Education Office for Civil Rights released data demonstrating that Black children across the country are being systematically denied access to an early education at the most critical period in their development. Black preschoolers are 3.6 times more likely to receive one or more suspensions than White preschoolers. Exclusionary discipline has no place in learning environments; all children deserve to experience an inclusive and affirming high-quality education. Today’s education system is not delivering on that promise. The disproportionate number of suspensions and expulsions incidences for Black children in early childhood education underscores widespread injustice and racial inequality in our early childhood education system. To deliver on the positive outcomes that are possible through high-quality early childhood education, NBCDI encourages early childhood education systems to eliminate exclusionary discipline, address racial bias and provide inclusive, affirming early learning environments. 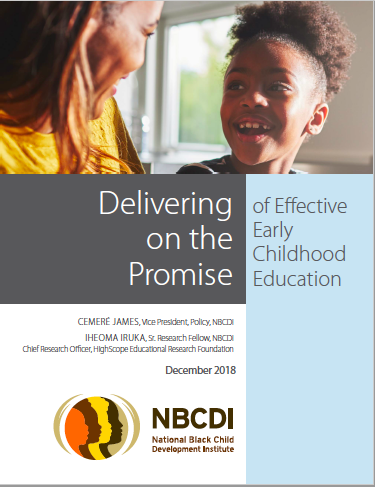 Read NBCDI’s “Delivering on the Promise of Effective Early Childhood Education” here. To get involved in an NBCDI Community of Practice or learn more about this and other NBCDI policy initiatives, please contact: Chloe Jordan, policy@nbcdi.org.